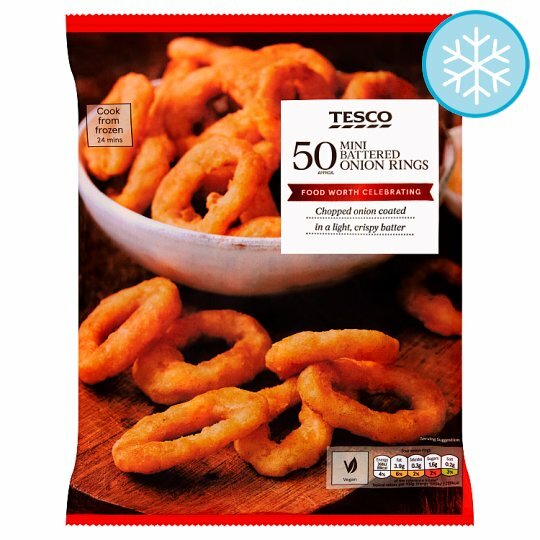 Mini onion rings made from diced onion, coated in batter. Mini onion rings, made with chopped onion, coated in batter. Perfect as an accompaniment to any dish any day of the week. Onion (53%), Wheat Flour (Wheat Flour, Calcium Carbonate, Iron, Niacin, Thiamin), Rapeseed Oil, Maize Flour, Water, Raising Agents (Disodium Phosphate, Sodium Bicarbonate), Dextrose, Gelling Agent (Sodium Alginate). Contains wheat. For allergens, including cereals containing gluten, see ingredients in bold. Instructions: 190°C/Fan 170°C/ GAS 5 22-24 mins Remove all packaging. Place on a baking tray in the centre of a pre-heated oven for 22-24 minutes. Turn onion rings half way through cooking.